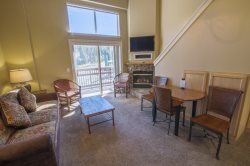 Meadow Stone Lodge is absolutely the number one preferred vacation rental in Kirkwood. Location and luxury is the reason. You are located in the center of all the action from cross-country out the back and getting on the lifts in the front. This very large 5 bedroom, 3 bath condo has an open living room wonderful for gathering together with your family and friends. Granite counters, radiant floor baseboard heating, wood windows and a large deck on the front are just some of the amenities. A large fully equipped kitchen also has a dining table for 6 with another table for 2 and bar seating for 2 more. A patio with access from three bedrooms is a really nice way to soak up the sun in those afternoon bluebird days. Warm up by the gas fireplace surrounded by rock after a day on the mountain. This condo actually sleeps 11 in beds and 2 more on a sofa bed. We advertise for less because we want to make sure our guests are happy. Showers need to be short and staggered out so the hot water can keep up. Meadow Stone Lodge is located just steps from one of Kirkwood Mountain Resort’s best known chair lifts, Cornice Express. Comprised of 34 rustic luxury residences, Meadow Stone Lodge offers luxurious two, three, and three bedroom plus loft condominiums, each outfitted in rustic style and equipped with all the comforts of home. The romantically tall towers surround a natural landscape of aspen trees and a stone-laden creek that greet guests as they enter the covered parking garage and entry lobbies. At Meadow Stone Lodge, you’ll stay just steps from the resort’s premiere downhill ski area as well as the Kirkwood Meadow, where you’ll find ample space for snow play and well-maintained cross-country and snowshoe trails. Heated driveways and sidewalks provide safe, easy building access, even on the stormiest days. Upon arriving, you’ll find direct access through the Aspen Building door straight into your condo. It couldn't be easier. There is parking right out front and one space in the garage for you. 5 Bedroom - Sleeps 11 - 2,160 square feet. 3 Bathrooms - We provide towels, soap, shampoo, conditioner and hairdryer. Please use water sparingly as water heater can not keep up sometimes. We provide the following amenities- GE Advantium convection/microwave, GE Profile oven, 5 burner cooktop, dining table seating for 6, second table for 2, bar seating for 2, dishwasher, coffee maker, basic pots and pans, dishes and silverware.